Let me catch you up with my life… lately, I have been stressing over this one big exam for a license for work. It only took me months to get ready and finally passed the exam last Weds! WOOOOHOOO! Who is happy?! I am and you should too 🙂 because that would give me more time to blog and connect with you all. Hopefully, more time to share my outfits with you all. I am short and I used to think I would never be able to pull off a trench coat, especially if they are longer and beneath my knees. But you know what? I think I pulled it off pretty well with this look lol. The trench coat finally got to see the light! History of this trench coat, about 4 years ago (MY GOODNESS… that flew by quick) I was in Singapore (you have to visit if you haven’t already) and shopping with my family and I came across a store call Miss Sixty (look them up) and oh my back then I was super young and didn’t have a job nor was I financially independent like I am now. $400+ for a jacket haha (if you knew me back then, I would of never bought it) but my aunt thought it would look nice on me and made me try it on. I was hesitant but I am glad I did. 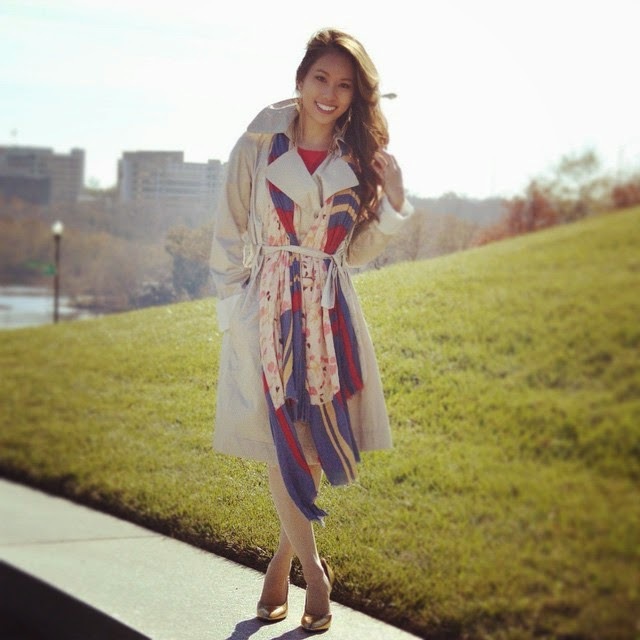 The color and the feeling of this trench coat is amazing! Super stylish if you ask me. I decided to style this coat with a big statement scarf I bought from Zara to make it pop out and add more colors to the look. Tell me what you think? Stay tune for more on the next post to find out what I did this weekend.